This second floor oceanfront condo at the Kihei Surfside Resort is located on the sought after ocean side of the elevator, and in the "3 stack", which is one of the closest to the ocean one bedroom condos in all of Kihei or Wailea. It has a spectacular view from the kitchen, living room, dining area and lanai. It is one of the larger, 1 bedroom, 1.5 bath units (680 sq ft). The view of the ocean and its abundant wildlife is absolutely breathtaking. It was completely remodeled and refurnished in August 2016, and is spectacular in every way! Considering its high level of finishing and location, we believe this is definitely one of the finest unit one bedroom, 1.5 bath units in the building. The entire unit has porcelain flooring. All the cabinetry was custom made on island. 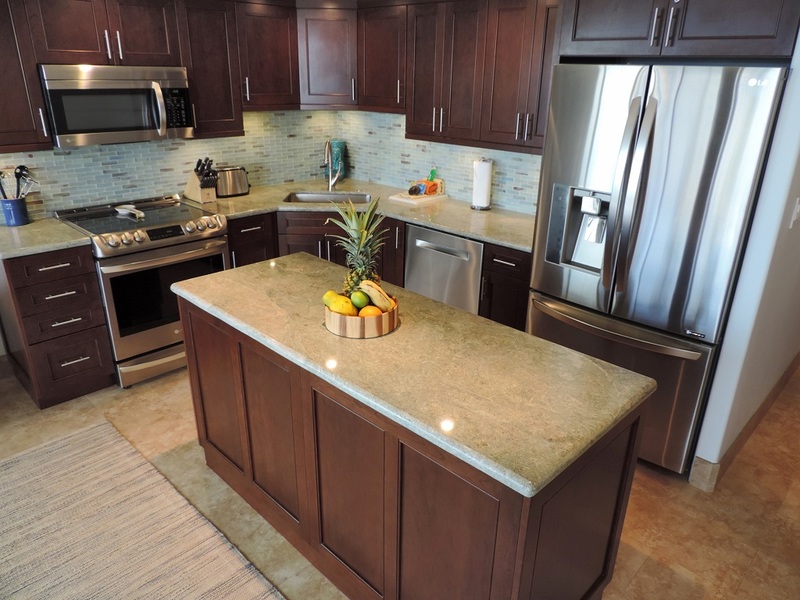 It is cherry stained maple, and all counters and vanities are topped with a very unique, light colored granite. All lighting in all rooms is controlled by dimmer switches. The oversized gourmet kitchen is spectacular! It is fully equipped with stainless steel Professional Series appliances, including side by side fridge/freezer with water and ice, flat top stove with five burners and warming drawer, quiet dishwasher, multi-function microwave oven, garbage disposer and a variety of small appliances including coffee maker, coffee grinder, four slice toaster, blender, crock pot, rice maker and hand mixer. There is also a large selection of higher end pots and pans, baking pans, high quality knife set, spice rack and ample matching dishes, glasses and cutlery. The “corner sink design allows for maximum efficiency and working space. The living room has a traditional sofa (no sofa bed). There is also a large 55" flat screen LCD HD color TV with an HD cable box c/w DVR and DVD player, and of course, a multi speed ceiling fan. 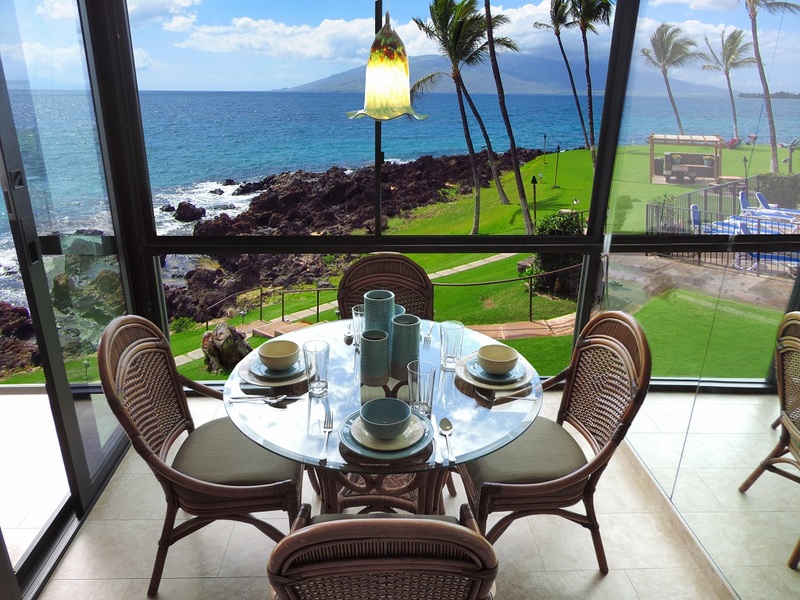 The dining area has an oversized round rattan glass table with 4 matching tropical armchairs. The large, private lanai has a glass bistro table with two swivel rocker chairs – a perfect place to enjoy your morning coffee or a romantic oceanfront dinner! The entry has a large built in, granite topped buffet with cabinets and a desk area with free high speed internet (wi-fi and Ethernet) and free long distance calling to the United States and Canada. 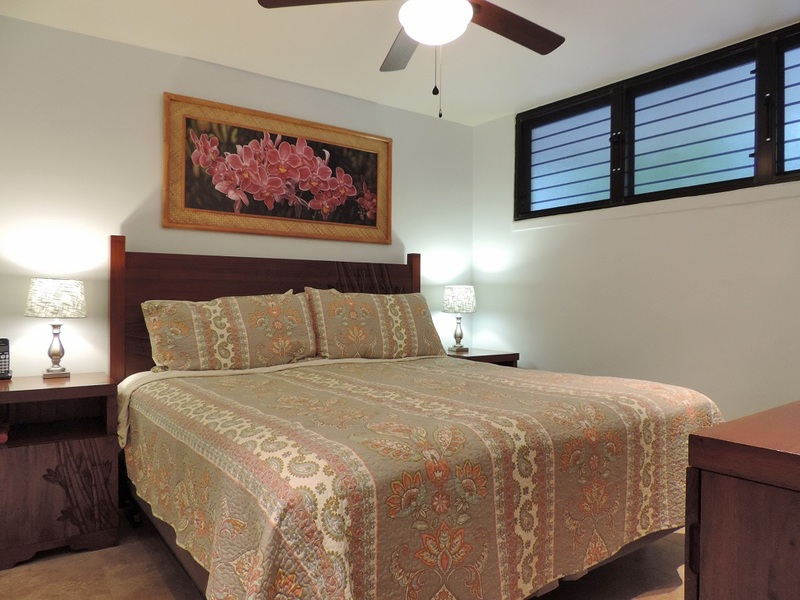 The bedroom has a high quality pillow top King size bed, high quality bedding, multi speed ceiling fan, Hawaiian style rattan furniture, plantation shutters, oversized closet, telephone and a wall mounted 32" flat screen LCD TV. The master bathroom has a full size, walk in shower with a Pulse shower spa system, including rain head, hand held wand/massager and six body sprays. There is an over height vanity with granite countertop. The matching half bath has been finished to the same high standard. Both bathrooms have Kohler toilets. The unit is fully equipped with, fresh linen and towels, iron/ironing board, hairdryer and beach gear that includes folding chairs, Egyptian cotton beach towels and cooler. 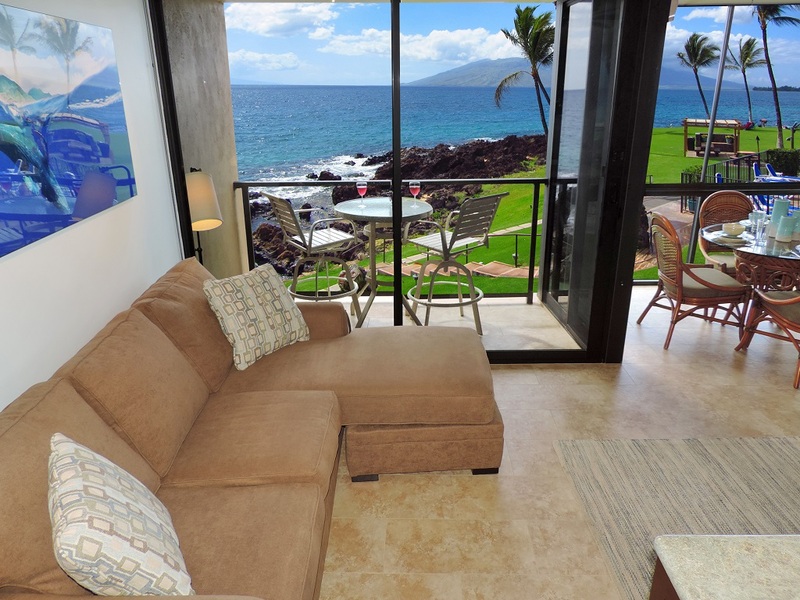 This unit is an excellent choice for guests who are looking for the best accommodation the Kihei Surfside has to offer; a spacious, comfortable high end oceanfront condo with a spectacular location and view of the Pacific Ocean and the West Maui mountains. THIS IS A HAWAII TRANSIENT ACCOMMODATIONS GOVERNED BY HAWAII LAW. HAWAII TRANSIENT ACCOMMODATIONS TAXES MUST BE PAID ON THE GROSS RENTS COLLECTED BY AN OPERATOR FROM ANY PERSON RENTING HAWAII TRANSIENT ACCOMMODATIONS. HAWAII LAW ALSO PROVIDES FURTHER REQUIREMENTS OF A TRANSIENT ACCOMMODATIONS OPERATOR.